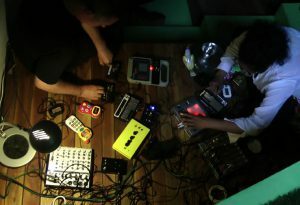 Excerpt from performance by Usurp Art’s Conspirators of Pleasure (Poulomi Desai and Simon Underwood) who were surprise guests at the eclectic Reproduce Listening Room at the award winning Anagram Architects Studio in Delhi. This concert was part of a two month project in India. The full line up for the night involved some of Delhi’s finest noise musicians: Hemant Sreekumar, Ravana, Jamblu (Kartik Pillai), Sister (Ruhail Kaizer). Big thanks to Rana Ghose at Reproduce for the night, and Anpu Varkey for the video.